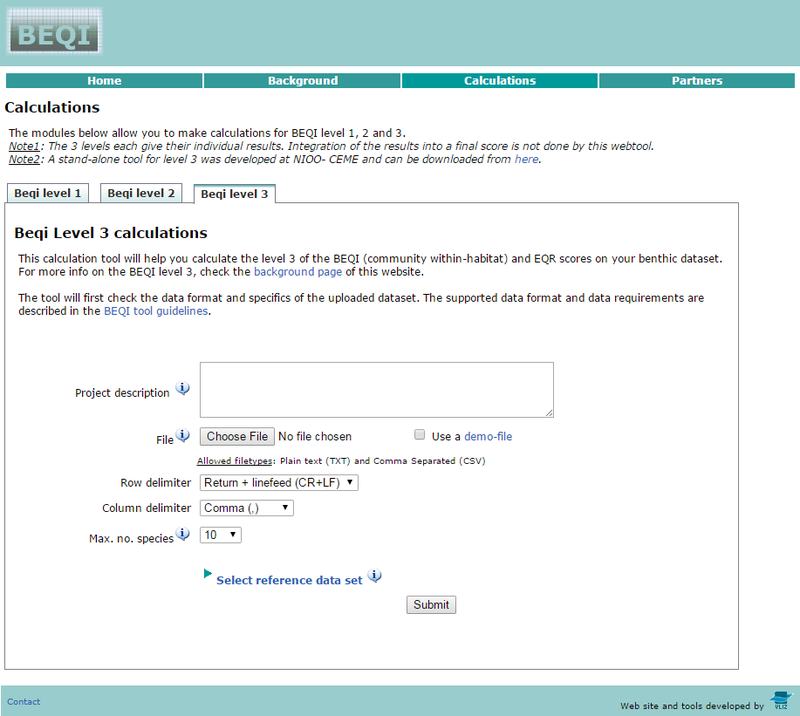 The Benthic Ecological Quality Index (BEQI) is one of the biological indices used to assess the state of the benthos of coastal and transitional waters for the Water Framework Directive. BEQI follows a multilevel approach proposed by Ysebaert & Herman (2004). Level 1 - Ecosystem level: On the level of the whole ecosystem (e.g. a water body) one can evaluate if the benthic macrofauna fulfills the functional role one might expect given the current ecological circumstances. At this level also integration with other quality measures is most appropriate, and information on the water body can be summarized. Level 2 - Habitat level: On the subsequent level the distribution of habitats (habitat completeness and complexity) can be evaluated. The size, shape, and spatial relationships of these habitats influence the dynamics of populations, communities, and ecosystems. Level 3 - Community (within habitat) level: Finally the biological quality of each particular habitat based on benthic macrofauna can be evaluated (community level within-habitat), with indicators that are sensitive to different types of stress and that can explain possible deviations. The overall metric primarily aims at providing a signal that is capable of showing significant changes/deviations from a certain reference state. The different levels will be explained further on in detail. Web tools and website were developed by Flanders Marine Institute (VLIZ).